The pesticide dibromochloropropane, known as DBCP, was developed by the chemical companies Dow and Shell in the 1950s to target wormlike, soil-dwelling creatures called nematodes. Despite signs that the chemical was dangerous, it was widely used in U.S. agriculture and on Chiquita and Dole banana plantations in Central America. In the late 1970s, DBCP was linked to male sterility, but an uneven regulatory process left many workers—especially on Dole’s banana farms—exposed for years after health risks were known. 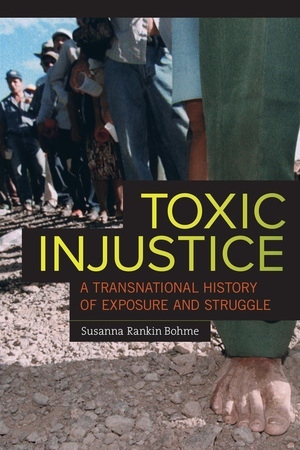 Susanna Rankin Bohme tells an intriguing, multilayered history that spans fifty years, highlighting the transnational reach of corporations and social justice movements. Toxic Injustice links health inequalities and worker struggles as it charts how people excluded from workplace and legal protections have found ways to challenge power structures and seek justice from states and transnational corporations alike. Susanna Rankin Bohme is Lecturer in History and Literature at Harvard University. "A new landmark in the literature on environmental health. Fluid and agile in scope, precise and searching in its pursuit of what matters most, Toxic Injustice tells a tale by turns harrowing and hopeful, as corporations with deep pockets and few scruples match up against activist-victims and their allies who, it turns out, have a few tricks up their own collective sleeves. A must-read for anyone wishing to understand the globalized economy of risk in our early twenty-first century: how its worst dangers get foisted upon the most vulnerable, but also how its cracks and crevices create new transnational openings for the pursuit of justice." "Toxic Injustice provides an important update to a long-running and well-publicized struggle on the part of agricultural workers from Central America against some of the best known and most powerful U.S.-based corporations. More importantly, it explores the limits and possibilities for those seeking justice or compensation from powerful transnational actors. Toxic Injustice confirms that taking on transnational corporations requires strategies and movements that are transnational in their reach, but it also reveals the ways that—despite reports of the demise of the nation-state—nationalisms and nation-states remain crucial forces in the contemporary world." "Toxic Injustice sheds new light on globalization and the nation-state. It is truly multidisciplinary, drawing together environmental, legal, medical, labor, industrial, and transnational histories. Susanna Rankin Bohme finds little-known sources to tell the story of how multinational companies and national governments have been involved with the production, distribution, and regulation of the pesticide DBCP, and the result is devastating." 6. National Law, Transnational Justice?